West Worcestershire MP Harriett Baldwin has offered her support to the Fairtrade initiative which helps farmers to get fair prices for their products across the globe. The MP attended a briefing in Westminster this week as part of Fairtrade Fortnight and met with farmers from the Ivory Coast, Rwanda and the Dominican Republic. The Fairtrade Foundation’s campaign ‘She Deserves a Living Income’ is shining a light on the poverty facing cocoa farmers in West Africa, where 60 per cent of cocoa is grown, who earn as little as 74p per day and are unable to pay for essentials like food, send their children to school or buy medicine if they fall sick. Harriett commented: “During my travels across Africa as part of my Ministerial job, I have seen at first hand, some really positive stories of how UK aid helps farmers. 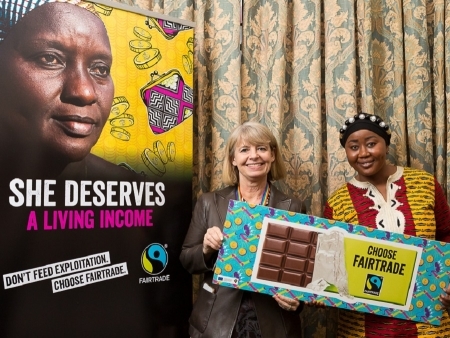 A new report from the Fairtrade Foundation, launched at the event in Parliament, reveals women cocoa farmers often carry the greatest burden and yet get the least reward. It calls on the government and businesses to ensure farmers earn living incomes by 2030 in line with the UN’s Global Goals to end poverty. Photo: Harriett Baldwin MP (left) is briefed by Fairtrade director Awa Traoré.